Players build a town in Ancient Greece in friendly competition with each another. But there is a catch. Each building must be surrounded by the appropriate scenery otherwise points are deducted. 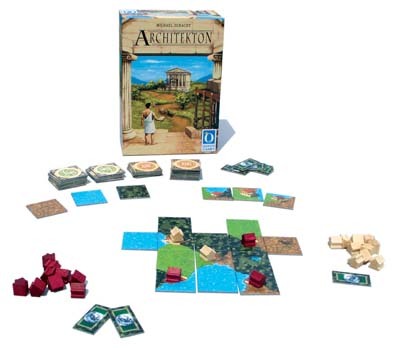 Architekton appears to be a tile-laying game about building houses in ancient Rome. However, this is just a front, and the actual game plays like an extremely competitive/cuttthrout abstract. For each house you place on the board, you can get points, but you can also lose points, and if you ever have negative points, you default - and the twist here is, you only start with 1 point! This means that you really need to watch your step and try to lure your opponent to make mistakes - a very tense game.